Remember your loved ones in a very special way. Christmas is a time of celebration and of love. It is a time for family and friends, but it is also a time to reflect and to remember those loved ones who are no longer with us. 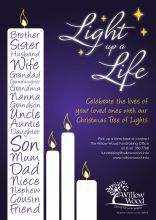 A wonderful way to remember them is to dedicate a light to shine in their memory on our Christmas Tree of Lights, and to have their name inscribed in both our Book of Memories at the Hospice and in our online book. By shining a light on our Christmas Tree of Lights you will be joining a community of love. Each name inscribed in this book is in loving memory of someone very special and we hope that seeing their name may bring peace and comfort as it invokes lasting memories. Your dedication will help us maintain our services to those thousands of local people passing through our doors each year. It is truly a wonderful way for you to remember and to honour your loved ones. You are warmly invited to attend one or both of our Celebration Carol Services with brass bands, choirs, readings and the dedication of the Trees. The Glossop service is on Tuesday 4 December at 6pm in the Market Arcade. The Tameside service is on Sunday 9 December at 2pm at the Albion Church, Ashton-under-Lyne.